If you expect your students to learn and display good social skills, then you need to lead by example. A teacher's welcoming and positive attitude sets the tone of behaivor between the students. They learn how to intereact with one another and value individuals. For example, teachers who expect students to use "inside voices" shouldn't be yelling at the class to get their attention. In other words, practice what you preach. Assigning classroom jobs to students provides opportunties to demonstrate responsibility, teamwork and leadership. Jobs such as handing out papers, taking attendance, and being a line-leader can highlight a student's strengths and in turn, build confidence. It also helps alleviate your workload! Teachers often rotate class jobs on a weekly or monthly basis, ensuring that every student has an opportunity to participate. Check out this list of classroom jobs for some ideas! As any teacher knows, it's important to not only teach the students a concept or lesson but then give them a chance to practice what they have learned. For example, if we teach students how to multiply, then we often provide a worksheet or activity for the students to show us their understanding of mulitiplication. The same holds true for teaching social skills. We need to provide students with opportunities to learn and practice their social skills. An effective method of practice is through role-playing. Teachers can provide structured scenarios in which the students can act out and offer immediate feedback. For more information on how to set-up and support effective role-playing in your classroom have a look at this resource from Learn Alberta. For years, I arranged for my students to become pen-pals with kids from another school. 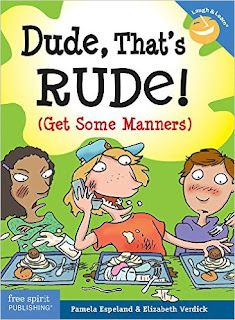 This activity was a favorite of mine on many different academic levels; most importantly it taught students how to demonstrate social skills through written communication. Particularly valuable for introverted personalities, writing letters gave students time to collect their thoughts. It levelled the playing field for students who had special needs or were non-verbal. I was also able to provide structured sentence frames in which the kids held polite conversation with their pen-pal. Setting up a pen-pal program in your classroom takes some preparation before the letter writing begins. You want to ensure that students have guidelines for content and personal safety. This article on Edutopia will give you some ideas! In addition to the academic benefits, large and small group activities can give students an opportunity to develop social skills such as teamwork, goal-setting and responsibility. Students are often assigned roles to uphold within the group such as Reporter, Scribe, or Time-Keeper. Sometimes these groups are self-determined and sometimes they are pre-arranged. Used selectively, group work can also help quieter students connect with others, appeals to extroverts, and reinforces respectful behavior. Examples of large group activities are group discussions, group projects and games. 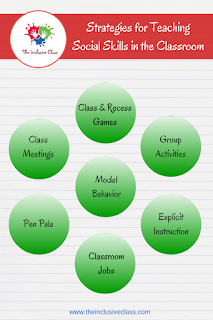 Smaller group activities can be used for more detailed assignments or activities. For suggestions on how to use grouping within your classroom, check out this awesome link. We know that learning to interact with peers is a very important social skill. It is just as important to learn how to interact with others who may be younger or older. The Big Buddy system is a great way for students to learn how to communicate with and respect different age groups. Often an older class will pair up with a younger class for an art project, reading time or games. Again, this type of activity needs to be pre-planned and carefully designed with student's strengths and interests in mind. Usually, classroom teachers meet ahead of time to create pairings of students and to prepare a structured activity. There is also time set aside for the teacher to set guidelines for interaction and ideas for conversation topics. Entire schools have also implemented buddy programs to enrich their student's lives. Here is an article that describes how to start a reading buddy program. There are dozens of stories for kids that teach social skills in direct or inadvertant ways. Find strategies to incoporate these stories in your class programs. You can set aside some time each day to read-aloud a story to the entire class or use a story to teach a lesson. Better yet, have your class write their own stories with characters who display certain character traits. Class Meetings are a wonderful way to teach students how to be diplomatic, show leadership, solve problems and take responsibility. They are usually held weekly and are a time for students to discuss current classroom events and issues. Successful and productive meetings involve discussions centered around classroom concerns and not individual problems. In addition, it reinforces the value that each person brings to the class. Before a class meeting, teachers can provide the students with group guidelines for behavior, prompts, and sentence frames to facilitate meaningful conversation. Here is a great article on Education World that describes the purpose and attributes of a Class Meeting. Finally, teachers can carve out a time in their curriculum to directly teach social skills to their students. Research-based programs such as Second Step provide teachers and schools with explicit lessons for social development. These programs can provide schools and classrooms with a common language, set of behavior expectations, and goals for the future. I have used programs such as Second Step in my classrooms with much success! Thanks for giving such great concrete examples and links for more! Glad you found it helpful!! :) Thanks for the feedback!